Something every Language/Library debate needs to keep in mind…. 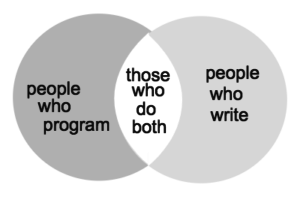 The intersection of people who write (and you might add write well to that) and those who program (and you might add those who program well to that) is a small portion of the entire picture. Sure, we don’t discard what is written about, but let’s not give it undue weight either. Ultimately, there is a silent majority of people building solutions who really don’t care about these discussions or flame wars because they are using what gets the job done. At the end of the day, use what gets the job done. Learn it well. Learn it deeply. If you’re one of the few who also has the gift/time to write, write about it!